Japanese Episode 239: "Kireihana vs Rafureshia! Sougen no Heiwa!" English Episode 530: "Whichever Way the Wind Blows"
Now that Satoshi has his seventh Gym Badge, he makes his way to the next gym in Fusube City. On the way, he encounters a bunch of Rafureshia and Kireihana, all fighting amonst themselves. After using his Bayleef to break the fight up, Satoshi sees a man named Saiga running to thank him. Saiga reveals that the pokemon are fighting over areas of land where the sun shines, since the grass pokemon need the sunlight to be healthy. He then reveals that the wind, carrying fragments of Sun Stones and Leaf Stones, is making the Kusaihana in the area evolve--if from the east, they evolve into Rafureshia, and if from the west, they evolve into Kireihana. As one side evolves, that side outnumbers the opposing side, so they immediately go battle for the land. After a huge wind storm evens out the numbers on each side, the pokemon fight each other over the land one last time. After the Rocket-Dan swoop in and try to catch them, the pokemon are forced to work together to save their friends. 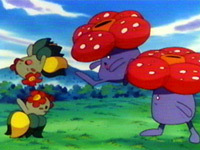 After fighting for the same cause, the pokemon become friends with one anther and stop fighting. Satoshi-tachi leave the prairie to head for the next gym. Is it just me or are the episodes right after a Gym Battle just completely uninteresting? After a great battling episode, we're forced to endure an episode about territorial plants, some of which have identity crises? While it does address something from the games (the branched evolution of Kusaihana), it just feels akward placed next to a Gym Battle. That and the fact that Satoshi really didn't do much other than stand back and watch the conflict going on (his Bayleef only helps out only a little bit) makes this a really useless episode. Ready Go! replaces Mezase Pokemon Master 2001 as the opening theme in Japan, while Pokettaari Monsutaari replaces Maemuki Roketto-Dan as the ending theme in Japan. This is the last time that the series gets a change of opening and closing songs, as these songs stay with the show until the end of the series. Since 4Kids already started their fifth opening/closing themes about thirty episodes ago, nothing changes with the dubbed opening. It's too bad you guys won't get to see Pokettaari Monsutaari--there's nothing like a dancing Inomuu to bring a smile to your face. The American version, on the other hand, uses the regular old motto! While they change James' first line to mention "groovy gas masks," the dubbed Team Rocket basically recites the regular version of their motto. Usually, it's the other way around--the Japanese version uses the regular version while the dubbed version changes it. It's kinda unlike 4Kids to be so bland and uncreative, but it's not that big a deal.